ATLUS today announced God Mode, a new third-person shooter set for official release in North America in early 2013 for PlayStation Network. God Mode brings together a visceral shoot ’em up with elements of an RPG, all set in a humorously dark view of the afterlife. Players take on the role of a descendant of an ancient god who is turned mortal when his family is banished from Mount Olympus. God Mode combines non-linear gameplay, fast and frantic shooting, hordes of on-screen enemies, and stunning visuals. The game hosts a single-player mode, as well as online and offline (via LAN) co-op play with 1-4 players. 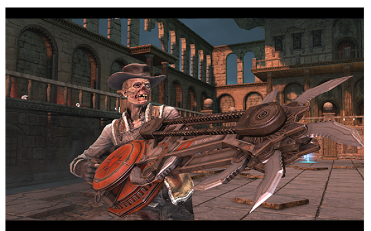 In addition to accessing more than 11 different weapons for battle, players are also equipped with a special ability fueled by Rage, which is gathered by amassing kills.